The Most Holy Name of Jesus - Optional Memorial - My Catholic Life! Mary and Joseph did not sit across from each other at the kitchen table in the evenings debating a name for their child. They didn’t flip through the pages of a book of saints or bounce ideas off of their friends and family. The baby’s name was chosen for them by God Himself. They were just taking orders. The Archangel Gabriel announced to Mary, “And now, you will conceive in your womb and bear a son, and you will name him Jesus” (Lk 1:31). And Joseph had a dream in which the angel told him, “You shall call his name Jesus, for he will save his people from their sins” (Mt 1:21). The Gospel of Luke further relates that “After eight days had passed, it was time to circumcise the child; and he was called Jesus, the name given by the angel before he was conceived in the womb” (Lk 2:21). Jesus was named eight days after Christmas, January 3. The New Testament is filled with incidents where the name of Jesus is invoked to drive out devils, cure illnesses, and perform miracles. The Holy Name is explicitly exalted by Saint Paul: “at the name of Jesus every knee should bend, in heaven and on earth, and under the earth…” (Philippians 2:10). Jesus reinforces the power of His own name in St. John’s Gospel: “If you ask the Father anything in my name he will give it you” (Jn 16:23). “Jesus” was the given name of the Son of Mary, while “Christ” was a title. “Christ” is the Greek form of the Hebrew “Messiah,” meaning the “Anointed One.” “Jesus the Christ” was the original formula for describing the Son of Mary. But over time, “The Christ” became simply “Christ,” as if it were His last name. The name of the God of the Old Testament was holy, not to be written out, nor to be casually spoken. Invoking “Yahweh” could be so egregious a sin as to provoke the tearing of the hearer’s shirt in protest and repentance. The Second Commandment enshrined this Jewish law: “Thou shalt not take the name of the Lord Thy God in vain.” This commandment prohibited the swearing of false oaths, that is, calling upon God as your witness and then making false statements. The opposite of a solemn oath is to invoke the name of God to damn someone or something: a curse, the inversion of a blessing. Saint Bernardine of Siena, an electrifying Franciscan preacher of the early fifteenth century, was the saint who most spread devotion to the Holy Name of Jesus. 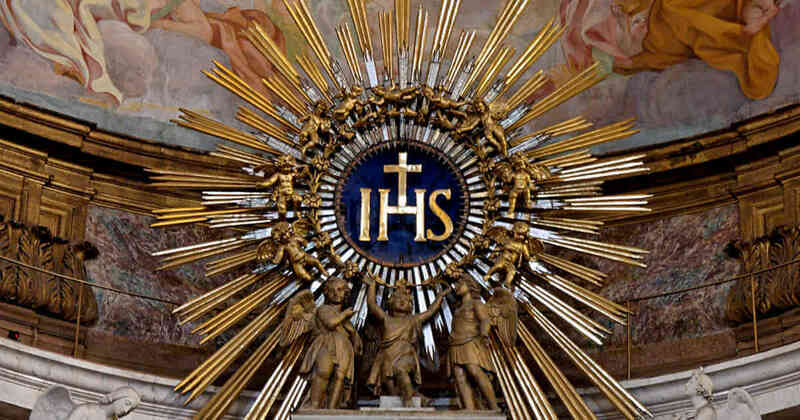 He ingeniously depicted the Holy Name with the well-known monogram “IHS,” derived from the Greek letters forming the word “Jesus.” In the sixteenth century, the Jesuits built on this tradition and utilized the “IHS” to embellish their churches, even making it the emblem of their Society. 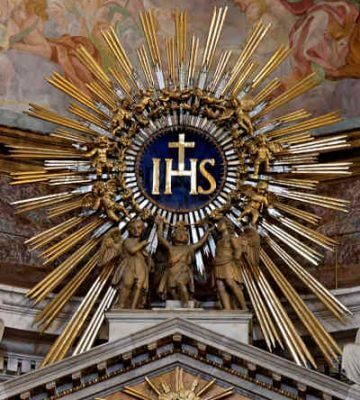 The mother church of all Jesuit churches, in Rome, is officially named in honor of the Most Holy Name of Jesus, although its name is commonly shortened to simply “The Jesus.” There is raw power in the name Jesus. It makes polite company cringe. It divides families. It floats across the dinner table, letting everyone know exactly where you stand. A comfortable, vague euphemism like “the man upstairs” or “the big guy” just won’t do. “Jesus” does not convey an idea that everyone can interpret as they wish. It’s someone’s name. And that someone taught, suffered, died, rose from the dead, ascended into heaven, and is seated at the right hand of the Father in heaven. Some people don’t like their names and seek to legally change them or to use a nickname instead. Names convey meanings. “Thor” sounds like a mythical god carrying a hammer. “Vesuvius” sounds like a boiling volcano about to erupt. And “Jesus” sounds like a God-man beyond reproach. A child, when once asked to define love, said that “when someone loves you, the way they say your name is different. Your name is safe in their mouth.” The Holy Name of Jesus should be safe in our mouths even when we’re not receiving communion. Son of Mary, may our same tongues that receive Your Holy Body and Blood prepare themselves for Your visit by saying Your Holy Name with great reverence. And may we not refrain from invoking that same Holy Name in our daily conversations with all whom we meet.